PLUSCO 604 Lubricating Sealant is a premium all-purpose lubricant and sealant designed for applications which require the very best product available. It is made with PLUSLON® PTFE resin which has the lowest coefficient for friction of any known material, and is not affected by acids, caustics, or any other common solvents. PLUSCO 604 Lubricating Sealant is unsurpassed as thread sealant in connections 2' or smaller. It seals pressures up to 20,000 psi and maybe used at temperatures up to 600°F. PLUSCO 604 Lubricating Sealant is especially effective when used on stainless steel threads, which have a very high tendency to gall and seize. It has also been used effectively on fiberglass threads, in plastics, various soft metals, as well as carbon steel. PLUSCO 604 Lubricating Sealant should not be used on oxygen lines due to its hydrocarbon content. PLUSCO 604 Lubricating Sealant may be mixed with conventional oils in gearbox applications to improve their performance provided there are no small orifices or bearings in the system. PLUSCO 604 seals off leaks, reduces friction and heat generation in gear systems. 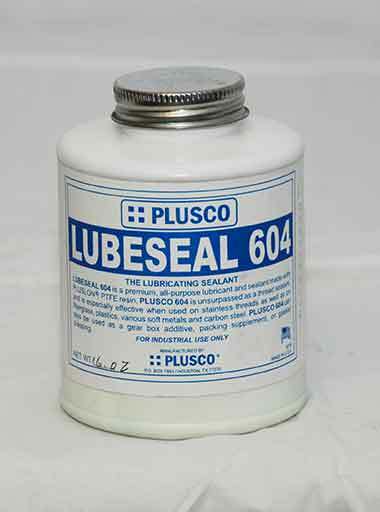 PLUSCO 604 Lubricating Sealant is recommended as a thread sealant to replace TEFLON tape. Making up threaded connections to hydraulic lines. Preparing threaded connections on plumbing lines. Making up connections on automatic fire prevention systems. Installation of pneumatic lines. Installation of meters, gauges and instrument lines. Any threaded connection where galling and seizing can occur. Making up of fiber glass, stainless steel, galvanized, ferrous, aluminum or dissimilar connections. Additive to seal off leaking gear boxes, reduce heat and decrease friction. Gasket dressing. Buttering of O-Rings. Recommended for application to studs and nuts, allows ease of breakout. Reduces friction and heat generation in gear systems. Making up flange connections. Some recommended application areas are : Apply to all conventional pump and valve packing. Additive to differential drives. Manual operated automotive transmissions.